Does your dog have doggy breath? Kitty have fish breath? Bad breath is more then just a nuisance to you. It is an indication that your pet’s teeth need attention. 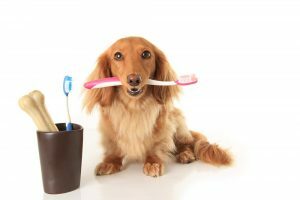 Dental problems are the most common issue among pets in the United States. It affects 70%-80% of all dogs and cats. The brown stains on the teeth are bacteria, and the mouth is an excellent portal to all the organs. Bacteria and infections in the mouth can easily cause infection anywhere in the body. Problems that develop in the mouth can seriously affect the overall health and longevity of our pets. We recommend that you have your pet’s teeth checked at every visit to ensure early detection of potential problems. If you notice bad breath, excessive drooling, gum discoloration or painful chewing, we should check your pet’s teeth right away. Remember, red means PAIN and brown mean Bacteria! Our dental services include teeth cleaning and polishing as well as tooth extractions.